2012 04 08, 13:12 – Panel one rendered and assembled on February 23rd, panels two and three rendered yesterday. At this point I still need to photoshop out some geometry errors (the mesh smooth on the plastic tub has a small error at the bottom of the handle inset), finalize the adjustment layers and create the line art. That last bit will probably be next weekend at the earliest. The environment was a relatively quick build – I put some element of it on the daily to-do list for last week and managed to pound it out, starting with “find the data” on Monday, “get it prepped for Silo” on Tuesday, and then various small achievable chunks on Wednesday and Thursday with a good-sized chunk of time invested on Friday. Production renders began on Saturday and as of this writing I’m over the hump, with 4.24 and panel four of 4.23 remaining. Recycled components include a Postmodern Steel filing cabinet, the Templar car radio and videophone and the Psyobs AV gear – HRV box, monitor, SVHS deck. All from 2005 – and in the case of the electronics, all ridiculously over-modeled. I went down to the rivets when I built the original models, and while my 2005 modeling technique is a bit messy it makes for excellent 3d “clip art” in this instance. As with panel three of the previous page, I’m using an Ambient Occlusion pass for each frame of this scene. The AO layer is adding enough to be worth further consideration for production use in DCR.5 and Transitional Voices – though an extra pass and a bit of photoshop for three pages worked on in fits and starts over a few weeks may not scale to a 20 page minimum-one-page-a-week marathon. 2012 04 16, 18:26 – Pencilled and inked Sunday, cleanup and primary assembly late Sunday night and Monday afternoon. Ready for shadow-matching, render cleanup, word balloon tails, etc. Oh, and full digital reconstruction on Emily in panel two. Probably overkill, anatomy is still a bit off, but the digital line art is a huge improvement over the original. 2012 04 17, 22:03 – Cleaned up render errors. 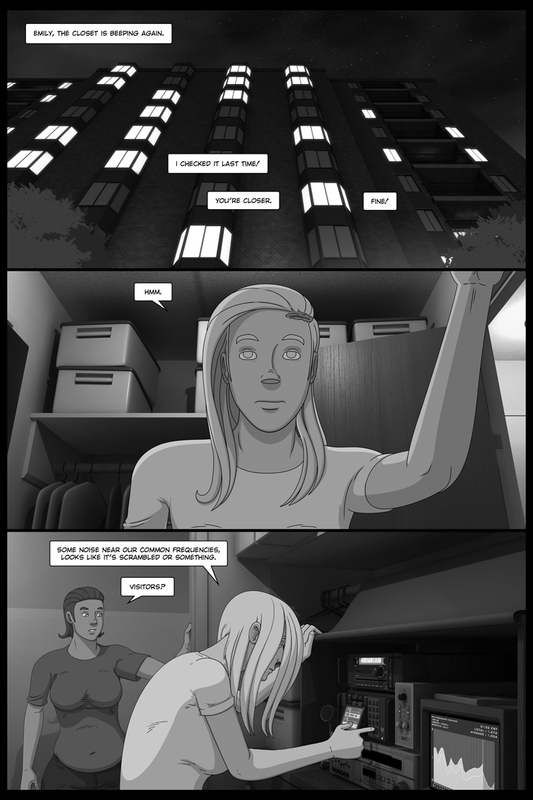 Environmental shading, tails added to word balloons. Ready for line art shading. 2012 04 18, 20:23 – The rest of today’s to-do list is complete. Time to start shading! Well… time to go smoke a cigarette, sip an energy drink, and waste five or ten minutes checking Facebook and the EVE Online forums on my phone. Then shading! 21:35 – Looks like it’s almost good to go. Primary shading is complete and I’ve been working on cleanup and tweaks for the past little bit. 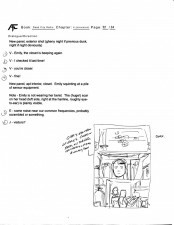 Also, minor dialogue revisions. Basically ready to post; gonna dig into the next page and hold off on posting in case I wind up making changes to the shading scheme. 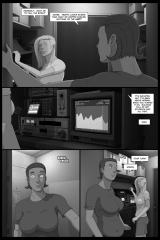 2012 04 20, 05:09 – Also means I can post THREE PAGES AT ONCE! 2012 04 20, 13:20 – Spit-shined. Ready to post!